Cauliflower has become trendy again, and it's mostly thanks to the low-carb crowd who use its mild flavor and soft texture as a replacement for things like rice and pizza dough. But instead of pounding or smashing it into submission, do yourself a favor and throw the entire head into the oven and roast the sucker. It's lazy but luxurious, and makes a delicious, spectacular-looking side dish. You can use any number of sauces, preparations, and spice mixtures to season your cauliflower head, but a simple baste of garlic and butter will go with almost any meal. Line an oven-safe baking sheet or baking dish with foil. Cut the cauliflower leaves and stem off so the head will stand upright on the dish. Put the cauliflower head on the sheet (or dish). Season it generously with salt and pepper to taste. In a separate small bowl, combine the butter, olive oil, and garlic. Slowly drizzle the butter and oil mixture over the top of the cauliflower, then spread the mixture evenly over the cauliflower with your hands. Bake until well-roasted but tender. 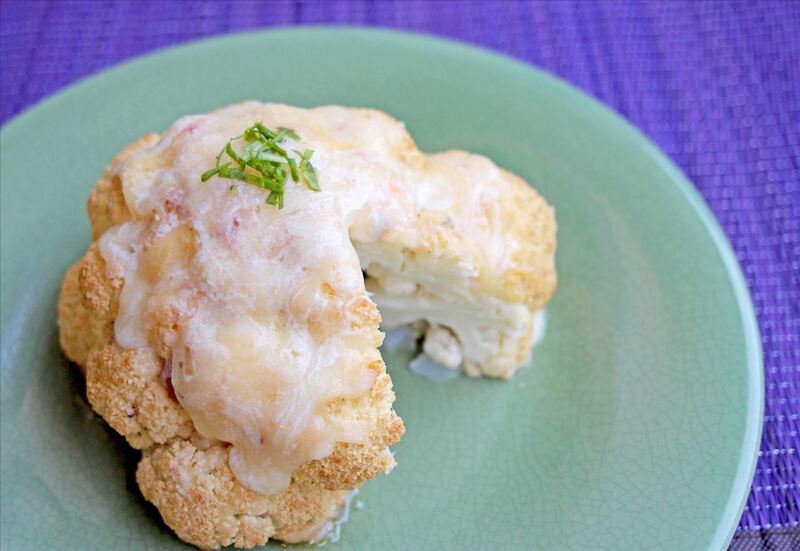 Depending on the size of the cauliflower, bake time may be anywhere from 1-1¼ hours. Five minutes before it's done, remove the foil, sprinkle the top with shredded cheese, and bake until it's melted and bubbly. 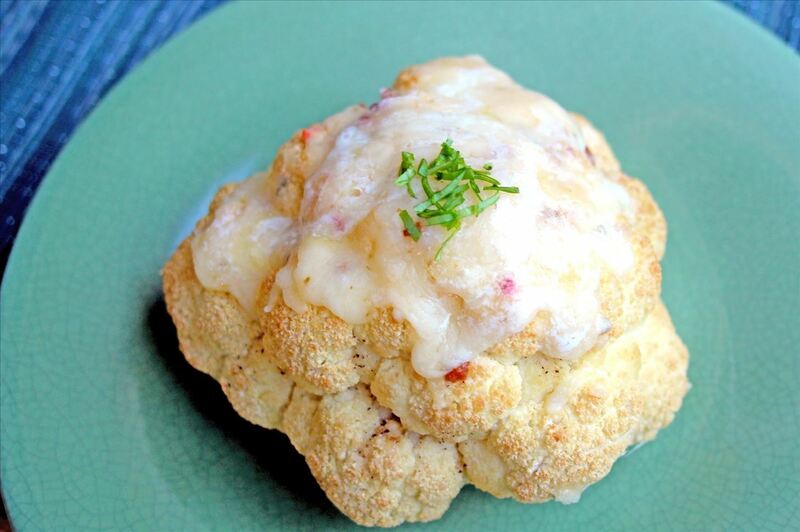 Remove the baking dish from the oven and garnish the cauliflower with chopped scallions, if using. Cut into thick wedges to serve. 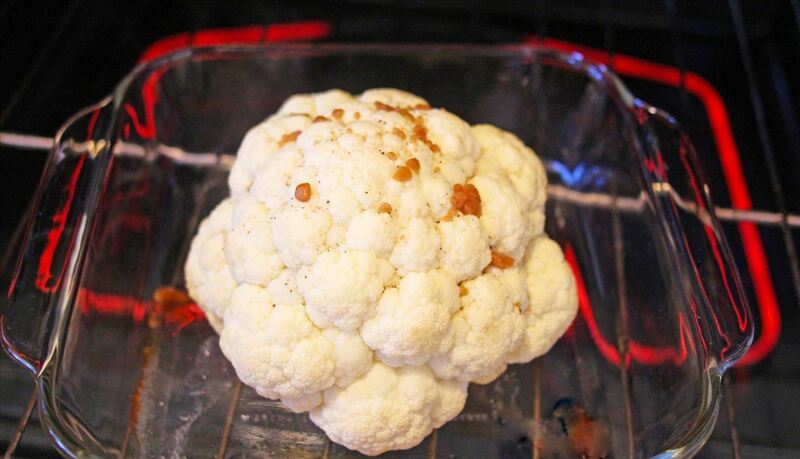 Roast cauliflower tastes a lot better than its boiled or steamed counterparts because of caramelization—the caramelized sugars on the surface neutralize the slightly-bitter taste of cauliflower. Roasting the cauliflower whole also preserves the bite of the vegetable as well: the thickness of the entire cauliflower head prevents any of its individual branches from being overly exposed to heat and turning soggy or soft. The result is an irresistible addition to your dinner table that just happens to be healthy, too. 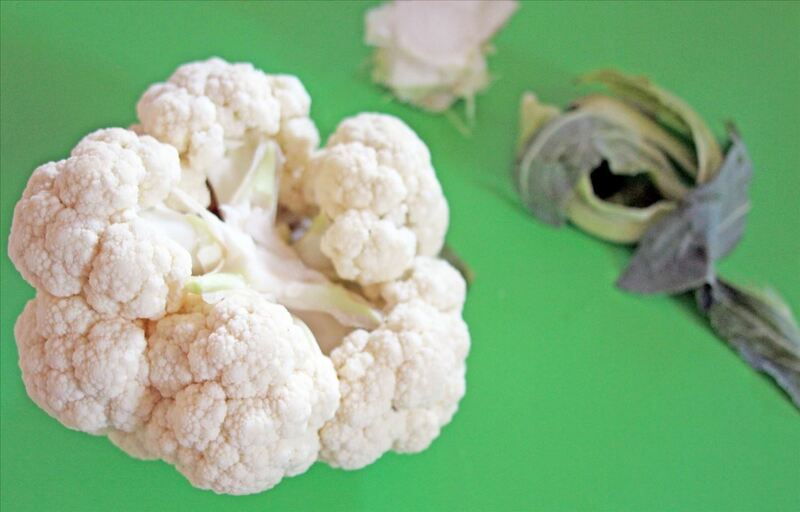 Let us know what your favorite cauliflower preparations are in the comments below.